Ross Brand with your Livestream Universe Update for Monday, September 17th, 2018. Solopreneurs face unique challenges that arise, in part, from spending so much time working alone. The events and conferences they attend have them doing more listening than sharing ideas and taking action. Coach Jennie — along with her partners Annie P Ruggles, Tamsen Horton, Carrie Smith Nicholson and Jenn Vasquez — are hosting Brilliance & Badassery October 21-22 in Chicago to provide a different experience for solopreneurs. On LivestreamDeals, Coach Jennie talked about the upcoming event. Jennie says the exchanges between attendees will help them avoid the mistakes made by other solopreneurs. You can learn more about Brilliance & Badassery at LivestreamDeals.com. Tell them ROSS sent you when you purchase your ticket. Catch the full interview with Coach Jennie as well as conversations with Rudy J Ellis of Switchboard Live and Mike Wilkerson of Voice Farm on the LivestreamUniverse Facebook page. 8pm ET, It’s #NezNation Live with Professor Nez. His guest is “Talking in Pictures” author Chelsea Peitz. Chelsea shares tips and strategies for mastering your presence on camera. View on the Nez Nation Live Facebook page. 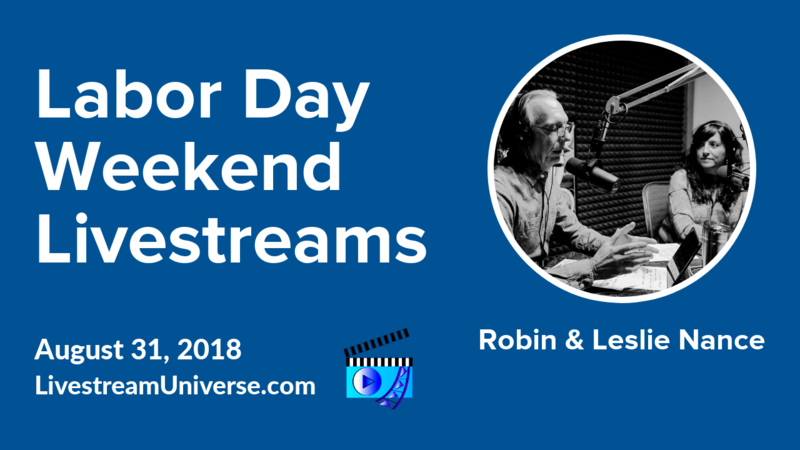 Ross Brand with your Livestream Universe Update for Friday, September 14th, 2018. How to you take one livestream and send it to multiple social channels? Switchboard Live has been providing a highly-regarded multi-platform streaming solution for years, starting out as Joicaster. On Livestream Deals, Switchboard CEO Rudy J Ellis talked about how the launch of Facebook Live led to the development of Switchboard Cloud. 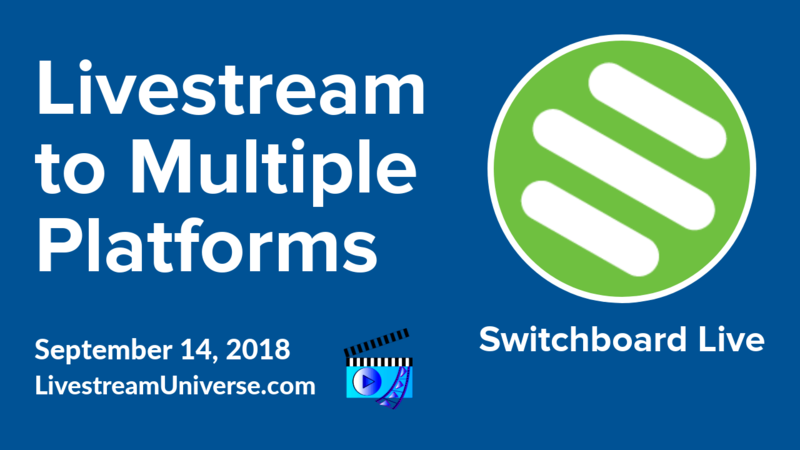 For LivestreamDeals one-year anniversary, Rudy and Switchboard are offering a special discount of 50 percent off your first month of Switchboard Cloud. Click the link at LivestreamDeals.com and enter promo code LivestreamDeals at checkout. 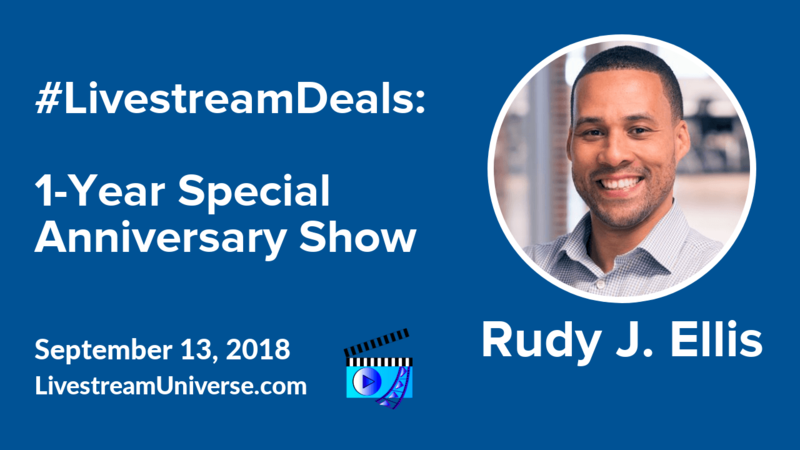 You can catch the full LivestreamDeals interview with Rudy J Ellis on the Livestream Universe Facebook page, The show includes conversations with Coach Jennie about her Business and Badassery event and Mike Wilkerson on opportunities to make money with voiceovers through Voice Farm. Also check out a separate video interview on the Facebook page with Jim Collison about his work with Gallup’s CliftonStrengths and the value of the StrengthsFinder assessment. More info on all products from the show at LivestreamDeals.com. Saturday at 9am ET is Nimmin Live with Nick and Dee helping you grow your YouTube channel. View at YouTube.com/NickNimmin. 12pm ET, it’s the New Media Show with Todd Cochrane and Rob Greenlee. View at NewMediaShow.com/live. For LivestreamUniverse.com, I’m Ross Brand. Have a great weekend! Ross Brand with your Livestream Universe Update for Thursday, September 13th, 2018. It’s the one-year anniversary show for LivestreamDeals tonight at 7pm ET. 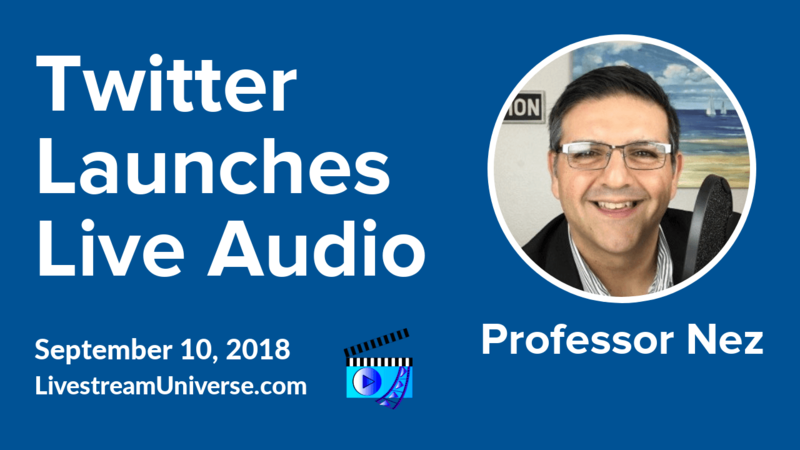 Join us to celebrate 12 months of connecting live streamers and podcasters with the products and services they need to create high-quality content. Guests include: Rudy J Ellis of Switchboard Live, Coach Jennie, co-founder of the Brilliance and Badassery conference, Jim Collison of Gallup CliftonStrengths (aka StrengthsFinder), Mike Wilkerson of Voice Farm and Tiffany Yarde joining us live from her book launch party in NYC. View on the Livestream Universe Facebook page at 7pm ET. RossBrand.Live takes you there. At 2pm ET, it’s the Bot Signal hosted by RJ Redden. That’s on the Black Belt Bots Facebook page. At 3pm ET, Jennifer Quinn hosts the JennyQ Show. Her guest is Attorney Allison, a criminal defense attorney who will talk about how she gets clients on social media. View on the JennyQ Show Facebook page. 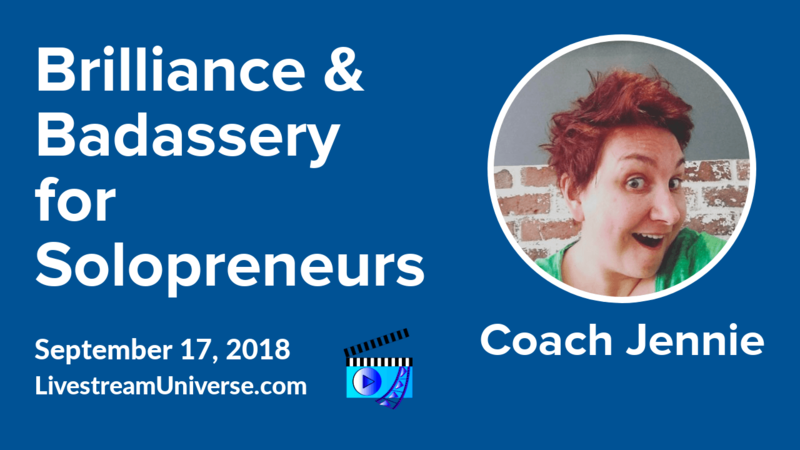 At 5pm ET, catch the Red Carpet Guide to Visibility and Influence with Joie Gharrity and guest Caren Glasser. That’s on the 113 Branding Facebook page. At 9pm ET, It’s Home Gadget Geeks with Jim Collison. His guest is podcast host and editor Emily Peck Prokop. View at TheAverageGuy.tv/live. At 10pm ET, It’s Social Chatter with Christian Karasiewicz, Nick Rishwain and guest Dorien Morin-van Dam. Get the latest social media news and app discoveries. That’s on the Social Chefs Facebook page. Don’t forget to join us for the one-year anniversary special of LivestreamDeals tonight, 7pm ET on the Livestream Universe Facebook page. Ross Brand with your Livestream Universe Update for Wednesday, September 12th, 2018. Dr Ai Addyson-Zhang kicks off a new season of Classroom Without Walls today at 5pm ET. Returning for her third guest appearance is content marketing expert, author and Express Writers CEO Julia McCoy. View on the Ai Addyson-Zhang Facebook page. 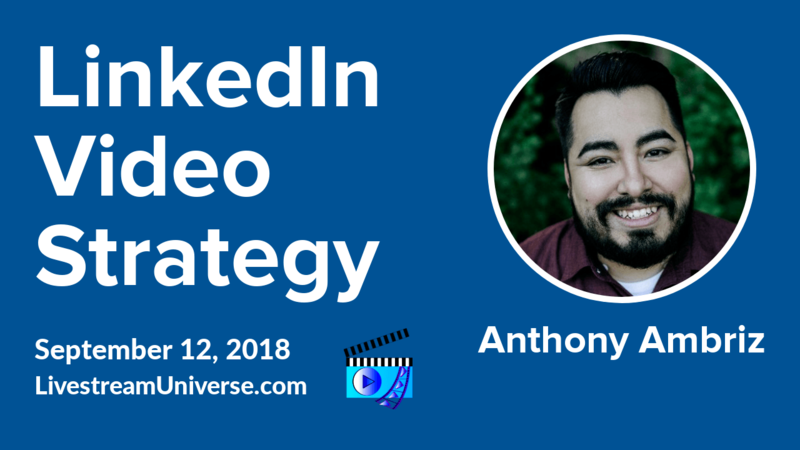 At 12pm ET – Owen Video and Nick Nimmin talk about making LinkedIn part of your video strategy. Anthony Ambriz joins the Business of Video Podcast. Catch it on the Owen Video X Facebook page. At 5pm ET — It’s BradsLive hosted by Brad Friedman. His guest is YouTuber Gord Isman. View on The Friedman Group Facebook page. At 8pm ET – Wagner dos Stantos hosts Wagner Live. The “Voice of Generation Z” Morissa Schwartz joins Wagner on the Wagner Live Show Facebook page. Ross Brand with your Livestream Universe Update for Monday, September 10th, 2018.
iOS users can now go live on Twitter & Periscope without appearing on camera. The audio-only broadcast feature provides the same metrics and uses the same interface as Twitter’s live video function. Professor Nez is the host of the #NezNation Live podcast. He says the addition of audio-only broadcasts is a good move by Twitter. You can listen to recent episodes of #NezNation Live focused on audio content at ProfessorNez.com/podcast. Speaking of audio, you’ll want to catch the must-see replay of the latest edition of Wirecast Live. Mike Russell of Music Radio Creative discusses audio levels, compression and more with Andrew Haley. Learn how to get the best sound for your livestreams. View on the Telestream Wirecast Facebook page. Ross Brand with your Livestream Universe Update for Friday, September 7th, 2018. Despite the built-in limitations imposed by Instagram Live, Todd Bergin develops sophisticated and highly-produced livestream shows on the platform. 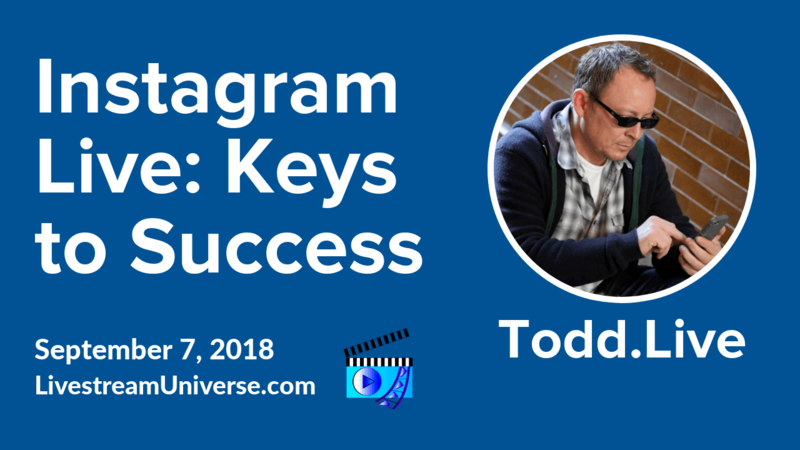 Known online as Todd.Live, he talks with Michael Stelzner on the latest episode of the Social Media Marketing Podcast, sharing tips for succeeding with live video on Instagram. Listen to “How to Create and Repurpose Intagram Live Content” at SocialMediaExaminer.com. Ross Brand with your Livestream Universe Update for Thursday, September 6th, 2018. 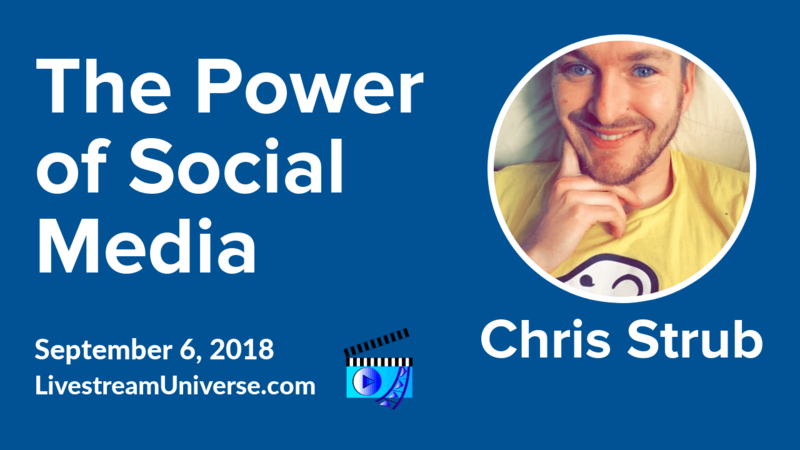 Chris Strub was a guest on BradsLive with Brad Friedman yesterday. He talked about live streaming for nonprofits, his drive for 10k followers on Instagram and the power of social media. View on The Friedman Group Facebook page. Also, check out Kim Doyal’s recent livestream with James Rose full of great productivity tips. That’s on The Kim Doyal Facebook page. At 9pm ET — It’s Home Gadget Geeks with Jim Collison. View at TheAverageGuy.tv/live. At 10pm ET, Christian Karasiewicz and Mike Gingerich host Social Chatter. They’ll be joined by Lindsey Margolis. Watch on the Social Chefs Facebook page. Ross Brand with your Livestream Universe Update for Tuesday, September 4th, 2018. 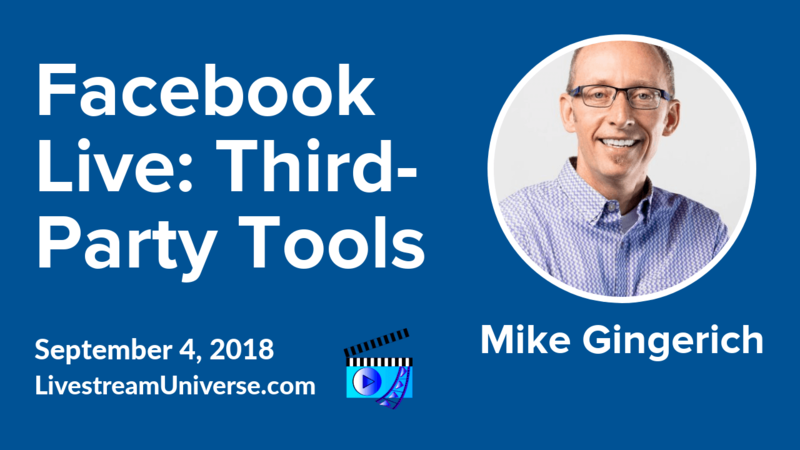 There’s no shortage of good third-party tools for enhancing Facebook Live broadcasts. Which one is best for your needs? Training Tuesday tackles that question today at 4pm ET. 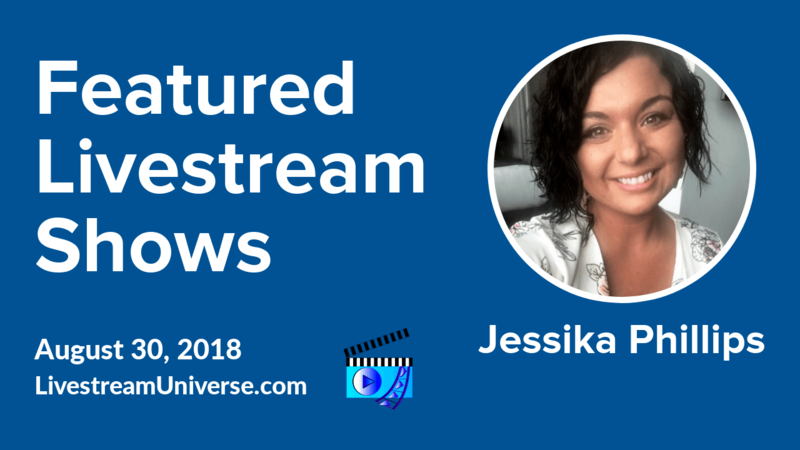 I’ll be filling in for Jessika Phillips and sharing my thoughts with Mike Gingerich on apps such as BeLive, BlueJeans, Ecamm, Zoom, Crowdcast, OBS and Wirecast. Join us at 4pm ET on the Magnet Marketers Facebook page. At 3pm ET, Eddie Garrison hosts EG Live. Today’s topic is the average lifespan of content. That’s on the Eddie Garrison Social Facebook page. Ross Brand with your Livestream Universe Update for Friday, August 31st, 2018. Happy Anniversary mom and dad. For LivestreamUniverse.com, I’m Ross Brand. Have a great weekend! Ross Brand with your Livestream Universe Update for Thursday, August 30th, 2018. At 2pm ET, it’s The Bot Signal with RJ Redden. View on the Black Belt Bots Facebook page. At 3pm ET, Eddie Garrison hosts EG Live. That’s on the Eddie Garrison Social Facebook page. At 10pm ET, Christian Karasiewicz and Phil Gerbyshak are back at their normal time slot with Social Chatter. They’ll be joined by Jessika Phillips of Now Marketing, Magnet Marketers and Social Media Week Lima, Ohio. Watch on the Social Chefs Facebook page.